The Suomi NPP satellite captured this image of the continental United States at night on Oct. 1, 2013. Amid one of the busiest travel weeks for Americans, NASA released a nighttime image of the nation from space, illuminating the arteries of transportation that will get so much use around Thanksgiving Day. The auto association AAA has estimated 43.4 million Americans will travel 50 miles (80 kilometers) or more to visit friends and family for Thanksgiving this year, with the average round trip 600 miles (1,000 kilometers). While some will board planes and trains, more than 90 percent of this week's travelers will be in cars or trucks, using the United States' 4.1 million miles (6.6 million kilometers) of roadways. 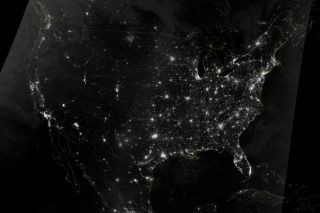 Nighttime images make it easier to trace this travel web, with nodes that brighten over major metropolitan areas like New York, Los Angeles and Chicago. The powerful, Earth-observing Suomi NPP satellite captured this view of the continental United States on Oct. 1, 2013, with its Visible Infrared Imaging Radiometer Suite (VIIRS). VIIRS is used to monitor fires, ice, oceans, vegetation and clouds, but the suite also has especially impressive nighttime capabilities. Because VIIRS can detect low levels of light, it can capture auroras, city lights and reflected moonlight on Earth's surface. It is even sensitive enough to detect and a pinprick of light from a lone ship in the ocean. "The images were collected just three days before the new moon, so reflected light from space and the atmosphere was relatively low," NASA said in its description of the image taken in October. "It was also a rare night when most of the nation was cloud-free." The minivan-sized Suomi NPP satellite, which launched in October 2011, was named in honor of the late meteorologist Verner E. Suomi. NPP stands for National Polar-orbiting Partnership, a reference to satellite's path around Earth's poles and the partnership between NASA and the National Oceanic and Atmospheric Administration (NOAA) to operate the $1.5 billion spacecraft.